Relationships are complicated and knowing the right questions to ask your girlfriend can really make the difference between a happy couple and an unhappy one. Take advantage of any time you have together and get to know your girl better through different types of questions. The fact is, questions to ask your girlfriend come in different varieties, and have different purposes. Here are some examples though every relationship is different and not all questions will be appropriate to all relationships. Questions in this category are basically the equivalent of the "sweet nothings" that pepper the conversations of any loving couple. They are rhetorical questions, and you can make them simply by changing a statement into a "Did you know…" type of question. While most questions should be asked in person, these are examples of questions you could ask your girlfriend by text. Did you know that I woke up this morning thinking I was the luckiest person in the world? Do you think everyone who's in love is this happy? Or did we just win the lottery? Did the rest of the world disappear or are we lost in each other? Did you know I prayed to God my whole life for this moment? Are you aware of how amazing you are? Yes, the questions can be sappy or silly, and that's ok - they aren't serious, they are the verbal equivalent of a hug or a squeeze on the hand. No matter what stage you're at in your relationship fun getting to know you questions help you learn about every aspect of your girlfriend's personality. Many fun relationship questions for couples can be asked of either person during date nights or relaxed moments at home to spark an interesting conversation. Which is cuter, a baby or a puppy? What's something you do to flirt with me that I don't notice? Why do you tuck your hair behind your ear whenever I look into your eyes? Do you like to be the big spoon or the little spoon? What's something that seems silly to others, but really freaks you out? Would you consider yourself more of a nerd, dweeb, or geek? Another practical area lies in the physical side of a relationship. Sometimes these questions can be embarrassing or awkward at first, but they are integral to a safer and more secure physical connection. Some questions should be asked before you engage in a physical relationship while other questions to ask your lover can come after physical contact. What do you think is a good level of intimacy? What kind of physical affection do you like? What kind do you like giving? What questions do you think about asking before getting intimate, but never work up the nerve to ask? What's one thing you wonder about a man's anatomy or sexual desires? It should be obvious that the only way these questions help a relationship is if both parties are completely honest. Almost anyone who has heard the phrase, "We need to talk." from their significant other learns to dread it; it often means some of the hard questions, the scary questions, are coming. Do you really love me, or is this just a fling? I'm not really sure about us, do you think this is working? Would you be comfortable meeting my parents? Do you think we're ready to get engaged? What are your expectations about marriage? The thing is, these are not really scary questions in and of themselves - it's the things people add on to them, in their heads, that make them scary. She may think your question means you're ready to call it quits, when in reality you may just want to hear how she feels. A good way to avoid this trend when the deep questions need to be asked is to set up a "safe space." 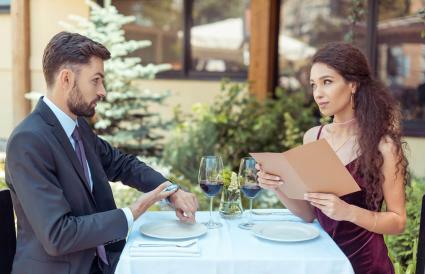 Aside from using non-threatening body language, start the conversation by establishing the positive stuff - that you love her, that you are happy in the relationship, that you are looking forward to many of the things you're going to do together. This way she is not going to worry that the deep questions are a prelude to the awful statements. These kinds of questions will vary the most from couple to couple, but they can be extremely important in avoiding misunderstandings and bickering. Many couples have had huge blowups when one person has not been clear on details; the best rule of thumb to avoid this is to ask when in doubt. Some of these questions can also help you establish your level of relationship compatibility before things get too serious. What time are we having dinner with your friends? Did you need me to pick you up from the shop? Is Tuesday still good for the movie? Can I come in the bathroom when you're using the toilet? How would you feel if I farted in front of you? Simple, banal things, but there is an added relationship benefit to asking these kinds of questions: they let her know that you are aware of her, of your connection to her, and that she is a priority in your mind. In a culture full of busyness and distraction, this can mean a lot. One kind of question that many men think is flattering is to question some other woman's appearance, trying to cast her in a negative light. "Do you think she realizes that dress makes her look huge?" might seem to be a way to flatter your girlfriend, but it is also likely to make her start to wonder if you think such things about her. It's usually best to stay positive, and easy. "Wow, I wonder if she realizes she's the second-most-beautiful woman in the room." is a better question. If she's uncomfortable answering your question, move to another topic and avoid putting her in a pressured situation. Let questions develop into a natural conversation rather than just firing off question after question. Whatever type of questions you're asking, make sure you ask them. Communication is the best way to keep a connection strong with your girlfriend, and with practice, it will be as natural as the first time you kissed.